It is almost impossible for me to believe that next week is Holy Week. I did not “give up” or “take up” anything for the season of Lent. But I spent a lot of time meditating on the story of Jesus’ disciples falling asleep in the garden when they were supposed to be praying with and for him on the eve of his death (see Matthew 26:36-40). I am not sure why this passage called me to it, but throughout this season I have been asking myself where God is calling me to be vigilant, but I am dozing off. Where am I being asked to support the work of the Gospel in the face of terror, pain and death, and I am not understanding or acting into the urgency? What is God calling me to be alert to? How can I stay alert, and keep my fellow disciples awake as well? These questions have challenged me a lot, and made me grateful all over again for the Easter message which both calls me to alertness, and loves me even when I’m found snoozing under a tree! This Bill on adopting and implementing the UN Declaration on the Rights of Indigenous Peoples is still before the Senate. March 20-21, General Secretary, Michael Thompson and Indigenous member of the All My Relations Group of the Diocese of Ottawa, Irene Barbeau took part in an ecumenical visit to the Senate in support of Bill C-262. The United Church of Canada, Canadian Friends Service Committee (Quakers), Mennonite Central Committee (Canada), and The Presbyterian Church in Canada were also represented in the delegation. We had hoped that it would already have gone from the Senate to the committee by now, and the window of time in which it can pass is becoming smaller every day. Even if you have already done so, would you take a few minutes to call and/or write senators, imploring them to get this passed? It has come too far to fail! UPDATE: Conservatives are filibustering to prevent the Indigenous Rights Act from going to committee. Please email Senator Don Plett (Opposition Whip) and demand that Conservative Senators back down from blocking due process (don.plett@sen.parl.gc.ca). One of my colleagues is counting down the days to General Synod 2019 in Vancouver, and we are now in the double digits! Did you know that one of the major pieces of work before General Synod will be resolutions on Indigenous self-determination? Maybe you have been part of this movement for decades, maybe you have never heard of it! That’s okay - I get asked about it a lot. In response to this, I will be putting together a backgrounder package on Indigenous self-determination - particularly geared towards non-Indigenous Synod delegates who wish to go into the Synod with a better understanding of the history of this movement, its emergence and reality today, and the resolutions before the Synod. 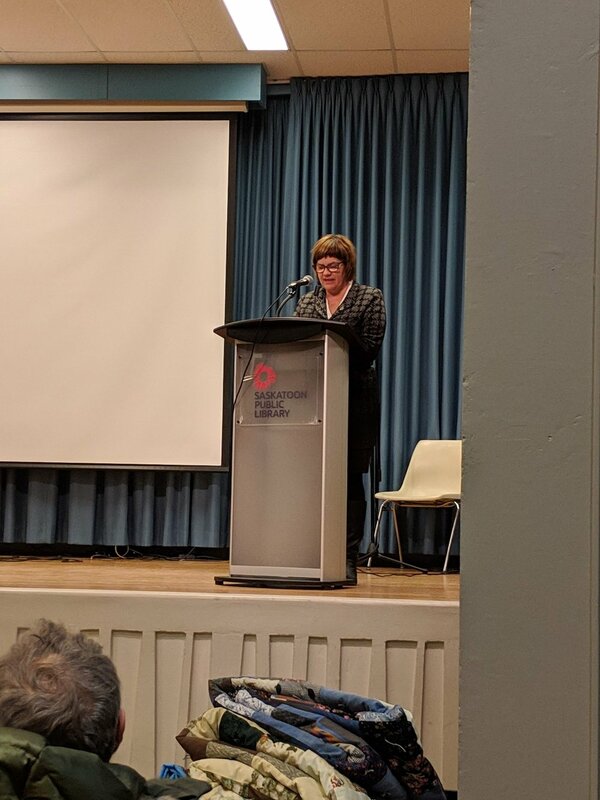 It will include documents produced by the Anglican Council of Indigenous Peoples (ACIP) and Indigenous Ministries, as well as news articles and the resolutions. Even though it is geared towards delegates, I will make sure it is made available through the newsletter so that you can also use it inform yourselves, and help others to understand as well. If there is a specific question you hope this packet will answer, please let me know so that I can track down answers and make it as informative as possible! Bishop Isaiah (Larry) Beardy addresses the Sacred Circle of the Northern Manitoba Area Mission of Mishamikoweesh. Q. Is there anything else you would like the rest of the church to know about the direction of the Northern Manitoba Area Mission? A. We need prayers and we need your support. Our budget is only $300,000 a year. We need support to provide stipends for our 15 active clergy, and we need support for training new ordained and lay ministers. If there is any parish, in any diocese, that is willing to partner with Northern Manitoba Area Mission, we are willing to share ministry and exchange visits with you. Please prayerfully consider this invitation to walk together in partnership. My visit to Tataskweyak in December introduced me to an incredible ministry of joy and pain, laughter and tears, inspiration and the prophetic manifestation of the Gospel. This is a profound opportunity to journey together in a way that calls to the presence of Christ in one another. Let me know if you would like to chat about this, or be in contact with Bishop Isaiah directly. You can also follow his ministry on Facebook here. The woes of winter travel are (almost?) over, so it is time to hit the road again. Here are some events coming up in my calendar. If you are in any of these places, I would be honoured to meet you! As always, please let me know what you are up to, and feel free to reach out if you need some help in getting started! CLICK HERE TO SIGN UP FOR THESE NEWSLETTERS AND TO READ OLDER ONES THAT HAVE BEEN ARCHIVED. Shawl Dancer, Chicken Dancer, Bustle Dancer. 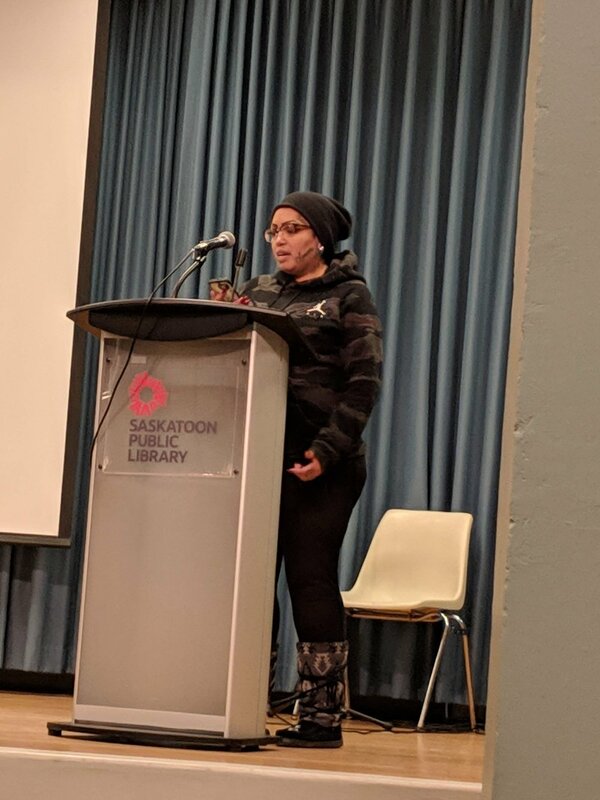 In Winnipeg, February 2019, the Mennonite Church of Canada began organizing a teach-in, to encourage support for Bill C-262. This bill will enable Canada to adopt the United Nations Declaration on the Rights of Indigenous People (UNDRIP). This bill is currently in the Senate. The Senate has the power to delay voting on this bill until the end of the current Parliamentary session. If the bill is delayed, it will die, however, supporters of UNDRIP have the power to create public pressure on Senators to pass the bill. Mennonites in Saskatoon picked up the challenge to invite ecumenical partners to organize a parallel event here in Saskatoon. A call went out, and in 3 weeks the “Called to Action” event was organized in support of Bill C-262. 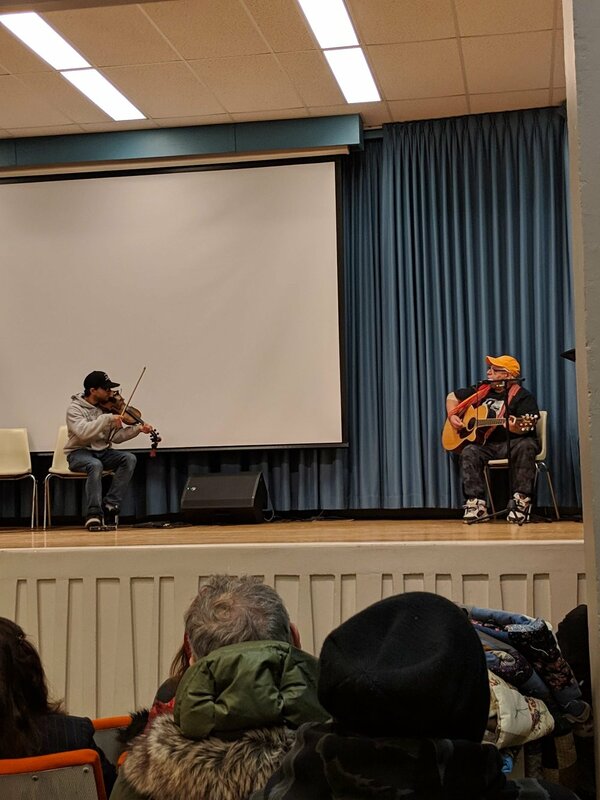 On the afternoon of March 2nd, diverse speakers, and culturally appropriate entertainers, Fiddlers, Drummers, Dancers, and Spoken Word Poets, gathered at the Francis Morrison Library. 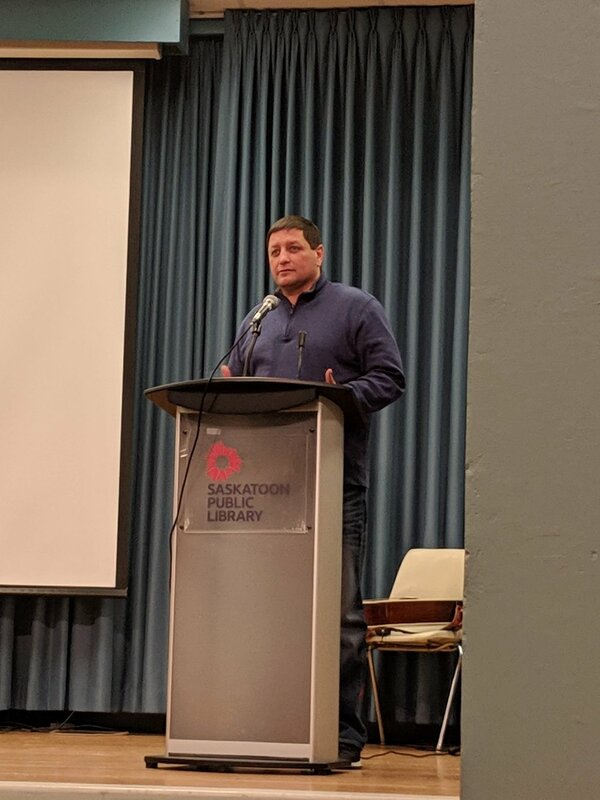 Mark Arcand, Saskatoon Tribal Chief, brought forth official greetings and spoke about local concerns. Sherri Benson, MP Saskatoon West, spoke on the importance of the passage of the bill. Harry Lafond, of Muskeg Lake Cree Nation, talked of the implementations of the Bill C-262 and the TRC recommendations. 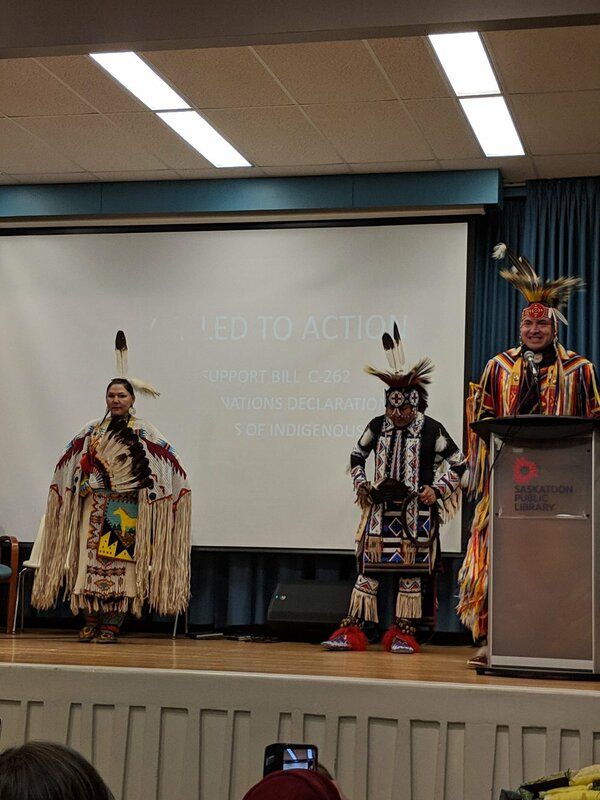 Bishop Christopher Harper spoke on the United Nations Declaration on the Rights of Indigenous Peoples (UNDRIP), Bill C-262, and the recommendations that arose from the TRC hearings. Bill C–262 was brought to Parliament to ensure that the laws of Canada are in harmony with UNDRIP as adopted by the United Nations in 2007. The Church can be the bridge to make the connection. Senator Lillian Dyck gave a comprehensive overview of how the Senate operates, helping us understand the Senate process and within it the political power to delay voting on the bill until it dies on the Senate floor. She encouraged us to have a voice and explained how we can walk the talk by directly contacting Senators to vote for bill C-262. Write Letters! Handwritten letters are often given attention due to the time and care it takes to write them. Phone calls, emails, and social media contacts are also influential. More education and understanding is hastily needed in communities’ and churches about UNDRIP and bill C-262. 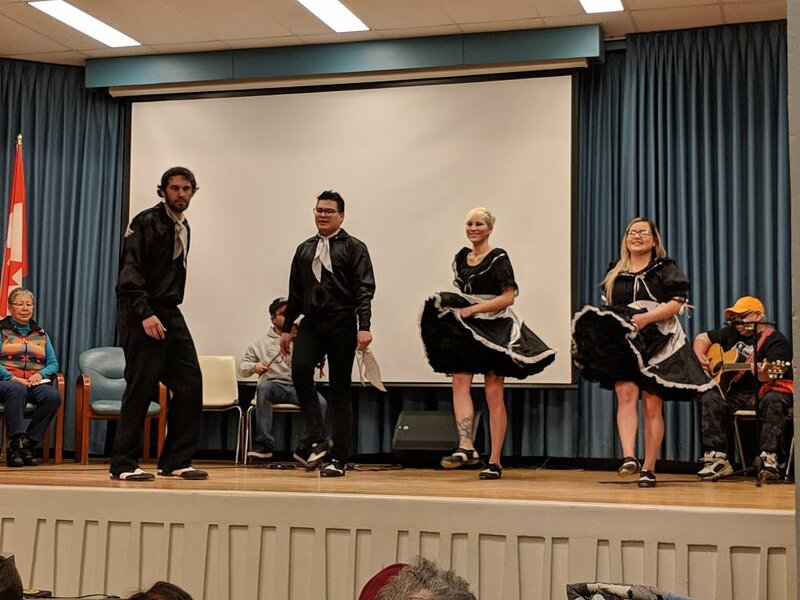 Click here to see a short video of the Metis dancers in the second picture below. The Rev. 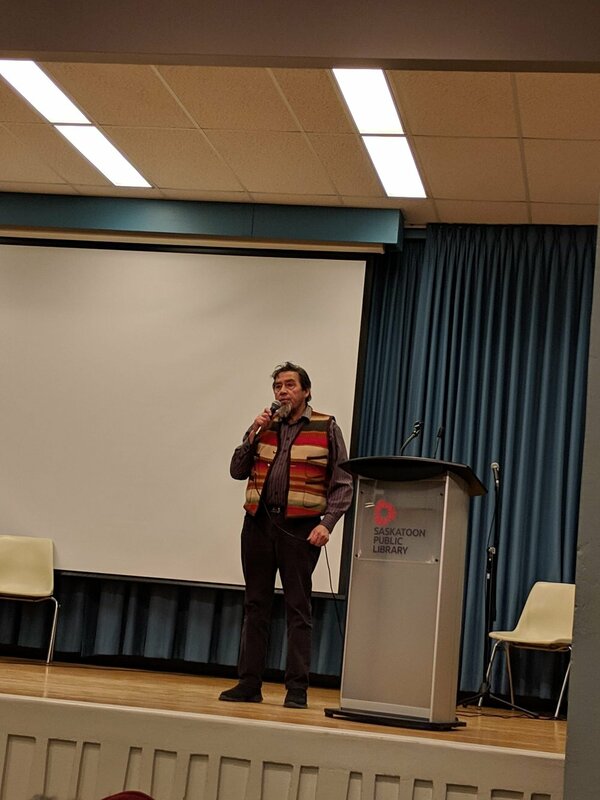 Samuel Halkett serves as language instructor for the Cree Language Healing Project in Prince Albert, Sask.—one of many community-based language recovery projects supported by the Anglican Healing Fund. Submitted photo from Anglican Church of Canada website. For 22 Days, the Anglican Church of Canada is calling people to learn, pray, and act for the Anglican Healing Fund, and its support for the recovery of Indigenous languages. 22 Days for Healing and Reconciliation start on May 31 and lead up to the National Aboriginal Day of Prayer on June 21. This year represents the second occurrence of the 22 Days project, which the church first observed in 2015 to mark the 22 days between the closing ceremonies of the Truth and Reconciliation Commission (TRC) and National Aboriginal Day. Anglicans observed those first 22 days by ringing church bells across the country to draw attention to missing and murdered Indigenous women and girls. In 2017, Anglicans are encouraged to mark 22 Days by learning about the Healing Fund and its role in bolstering community-based projects to preserve Indigenous languages; praying for those who seek healing through language recovery; and acting to support the Healing Fund through prayer and donations. The focus on the Healing Fund and language recovery—both for 22 Days and the annual fundraising campaign Giving With Grace—reflects the crucial role of language as a pillar of Indigenous culture and identity, as the church strives to live out the 94 Calls to Action identified by the TRC. “When you don’t know your language, you lose your identity,” Healing Fund Coordinator Esther Wesley said. Over the last 25 years, the Healing Fund has worked on community projects with an estimated 700 different groups across Canada. 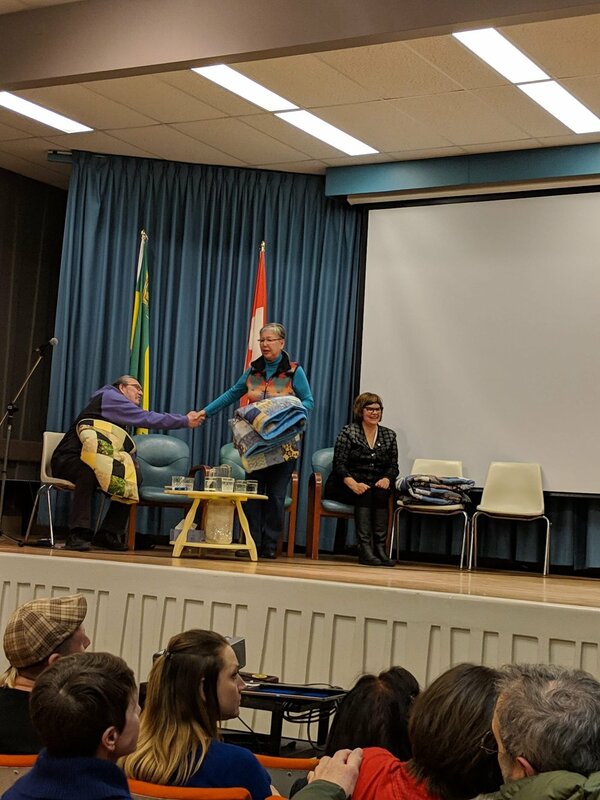 Since Wesley began her work in 2004, she has observed an evolution in how residential school survivors and their families have grappled with the process of healing from the intergenerational impact of the schools. 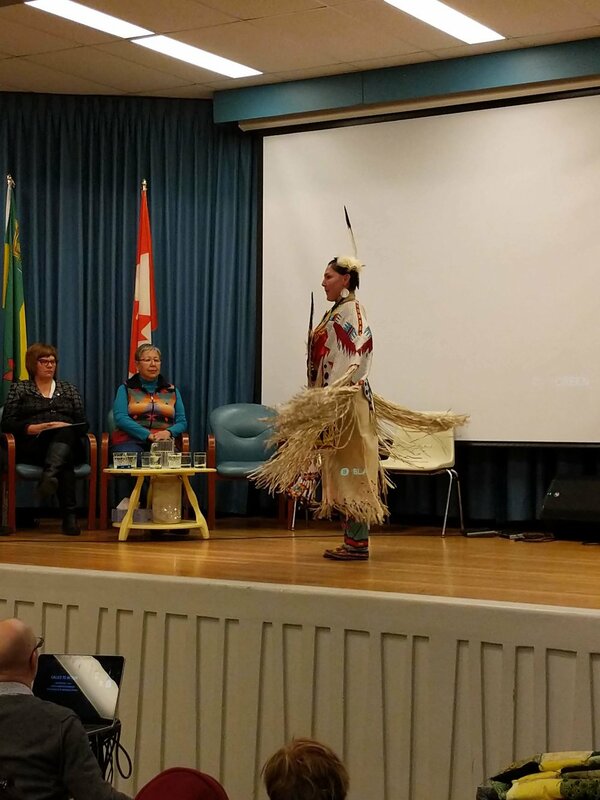 The 1990s saw the first community gatherings where survivors began speaking about emotional, physical, and sexual abuse they had endured in residential schools. Later, they attended school reunions with classmates. During that time, Wesley said, both Indigenous and non-Indigenous churches rarely discussed or mentioned cultural values. 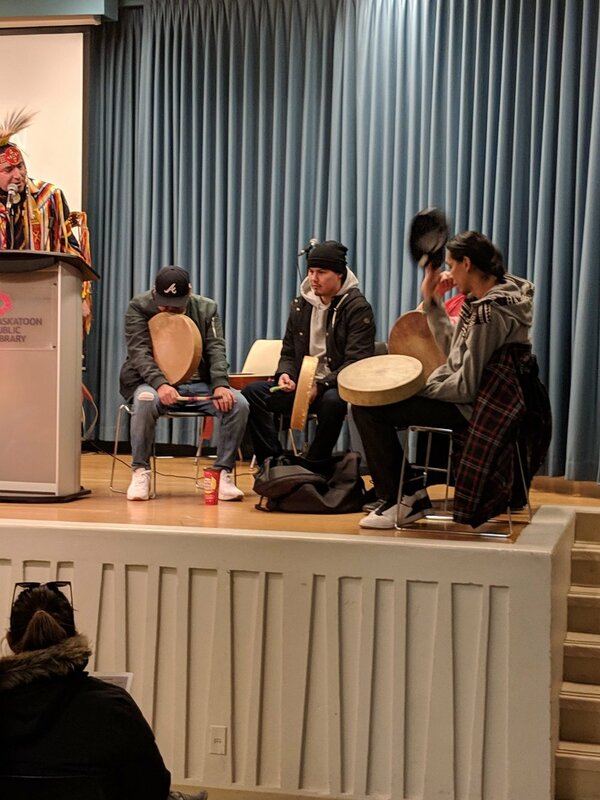 With the growing prevalence of projects based on cultural practices in the wake of the TRC, Wesley hoped that this year’s 22 Days would make people more aware of language loss across Canada. Archbishop Fred Hiltz, Primate of the Anglican Church of Canada, noted that this year’s 22 Days coincides with the appointment of Melanie Delva as reconciliation animator, as well as the day of Pentecost—the same day on which, in the Acts of the Apostles, a crowd comes together with each person hearing the Good News in their own language. “I think people are more conscious than ever of the importance of recovering of language … so I think this has the potential to really, really ignite a lot of interest and commitment from people,” the Primate said. He expressed his hope that the 22 Days would become a standing commitment for the Anglican Church of Canada well into the future. View a list of resources to observe this year’s 22 Days. Sign up for the event on Facebook at www.facebook.com/canadiananglican. Interested in keeping up-to-date on news and information from the Anglican Church of Canada? Sign up for email alerts and get our stories delivered right to your inbox. The Truth and Reconciliation commission presented its final report this week, and there’s a sense across Indian country that we had reached an important milestone. The TRC spent six years travelling across Canada to document the stories of the survivors of their residential school experience. What emerged was generations of pain and suffering on the part of the survivors and their descendants. It was also a wake-up call to other Canadians who may have had a passing knowledge of boarding schools, but no idea as to the damage the schools caused. The TRC also the first major commission to be driven by First Nations people. The three commissioners, Judge Murray Sinclair, Chief Wilton Littlechild and Marie Wilson conducted the commission with cultural understanding and class like no other in Canadian history. History will record they were the true heroes of change and a 21st-century example of warriors. The TRC could have been the platform for revenge and a witch-hunt, but instead became a platform for healing and change. The stories that poured forth from the survivors raised a curtain on the racist and draconian world that First Nations people inhabited for most of the 20th century. Stories of loneliness, sexual abuse, violence both from the staff and from older students emerged to paint a picture of a hell on Earth. At a time when Western Canada was being settled, the largest buildings across the North and the Prairies were residential schools. The first of these wooden structures and were fire traps. These schools at Delmas, Onion Lake and Lac La Ronge all burned in spectacular fires. The brick structures that survived were imposing structures that left no doubt among the First Nations population as to who held the power over them. I recall a friend saying that he spent years separated from his family. In the morning he would go up to the school’s third floor from where he could see his parents’ home and the smoke from the chimney. He would imagine his parents making coffee and beginning another day without their children. The TRC brought out stories of the impact of the boarding schools on children, but the other story was of the communities that was left behind. It was the First Nations’ version of the Pied Piper of Hamlin. The older children would be removed, leaving behind little children and parents in an unnatural community. They left behind empty hearts and lonely parents. The law stated that Indian parents had to make their children available to attend residential school, and they could go to jail for not complying. One of the most moving statements this week came from Saskatchewan’s Eugene Arcand, who held up a picture of his Grade 2 class at a residential school. Of the 32 students in the photo, just nine are alive today. This in itself is a damning testament to the harm wrought by these institutions. To say that the residential schools were an abject failure is an understatement. The hurt and lasting damage left a deep scar on First Nations society. The real triumph of the TRC was the process that allowed the truth to emerge and reconciliation to take root. If this process had only been an airing of grievances, it would not have completed its mandate. While this is not a part of Canada’s history that we can ignore and forget, it is time to move on and reconcile our past with our future. We owe it to the children who never returned from these schools to prove our strength over the system that tried to destroy us but failed.